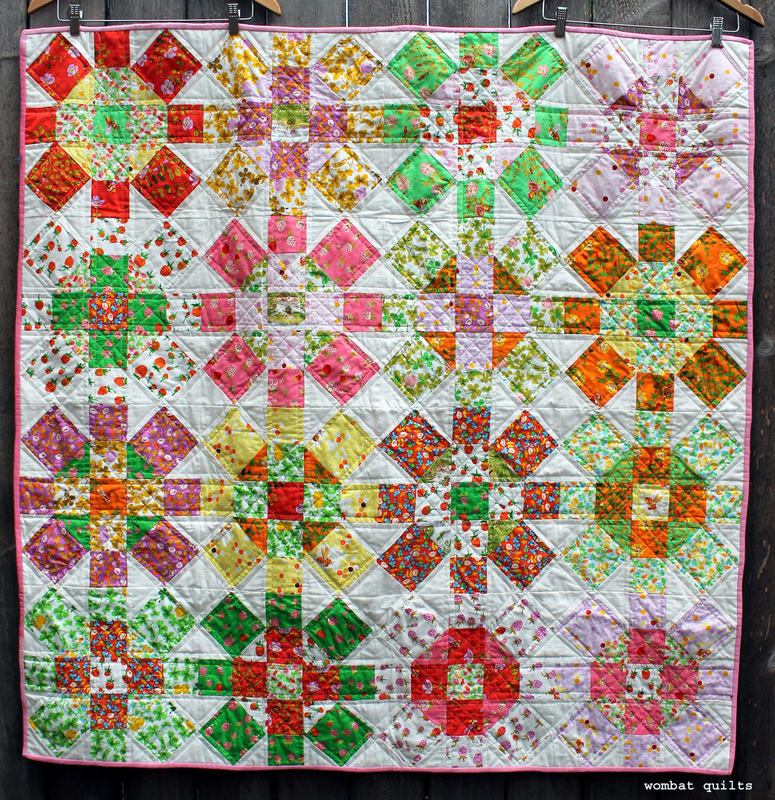 This darling quilt, made using just Heather Ross’s Briar Rose and Kona white, is for my cousin’s daughter, Annabel. I started it in October last year (I really am slow to finish stuff without a deadline), and you can find out more about the pattern on my original post. A few years ago I made Annabel a baby quilt, but never got it to her (I am also slow to post things!). 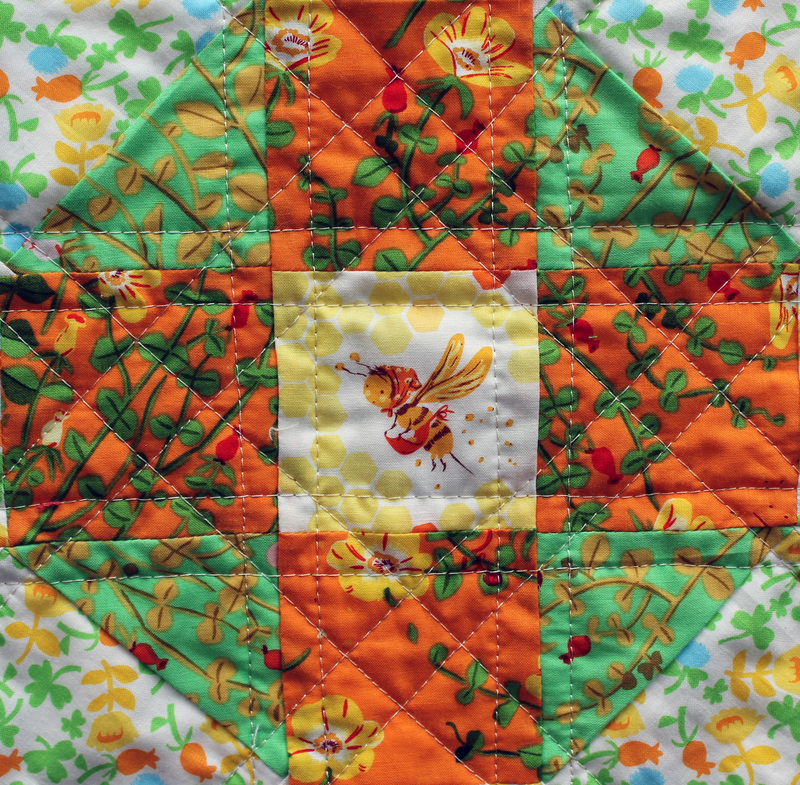 After she was no longer a baby, I gave her quilt to Project Linus and started making this quilt… which is much more young lady appropriate. For the quilting I used some of the lines of the block as a guide and ended up with a really cool pattern of stitches, some straight and some diagonal. So one Aussie bound quilt done, two to go! Oh my, this is a really lovely quilt. Thank you for sharing. Annabel is a lucky young lady. I think she’ll love her quilt. Hi, I LOVE your blog. You’re coming to Australia?!?! I’d love to meet you in person after following your blog for so long now. Any chance you will be in/near Sydney? Emily, sent you a separate message but we are hitting up Brisbane and Melbourne only this time…next time Sydney. I have the dates you gave me earlier, so I’m still hoping for a chance to catch up with you down in BrisVegas. 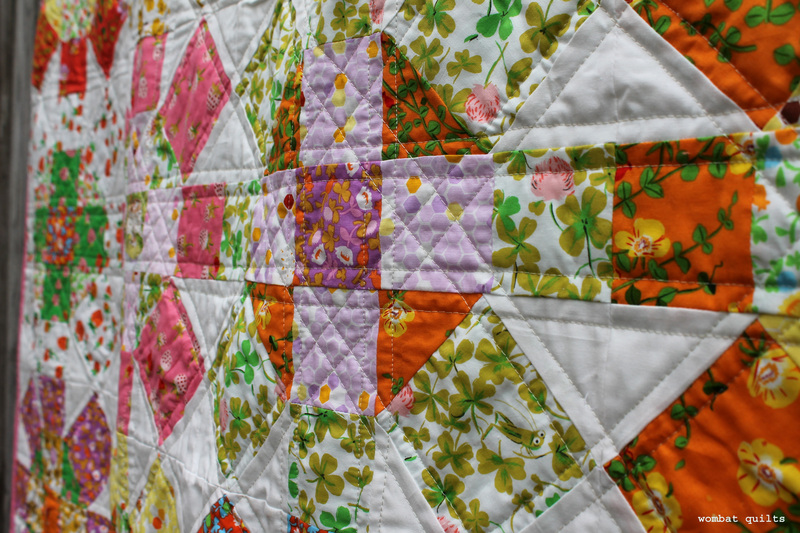 That is one seriously sweet and pretty quilt. How many more are you, erm, challenging yourself to finish before you get here? Kate the dates have not changed and I am so excited to met you in person. 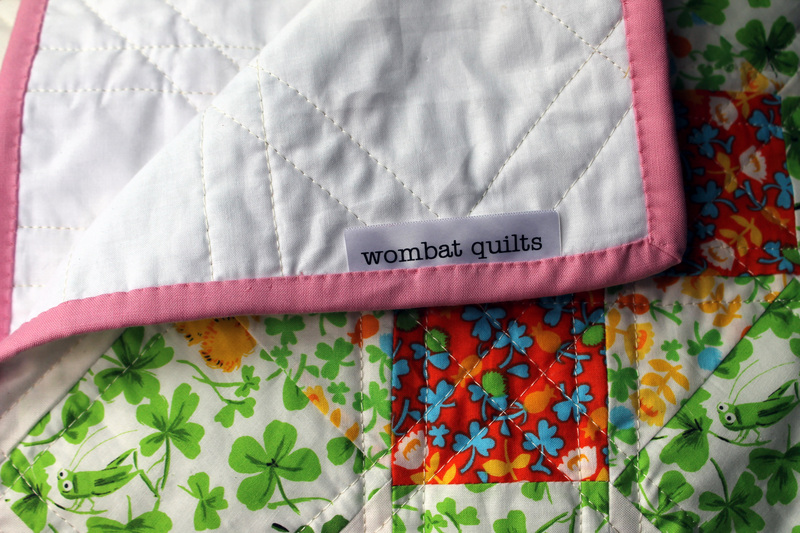 I have two more quilts to finish up for Australia. Nick is not packing many clothes, the rest of his suitcase will be full of quilts. Lol. I love how use of color and value can change the look of a block. I’ve seen this block (actually, not quite but very similar) before, but not like this. Very pretty. I am sure your cousin will love it. This is lovely! I love this range of fabric and love how you’ve pieced it together. It’s gorgeous! For some reason I was under the impression that you were taking quilts home for a trunk show, not as gifts. Well, that’s my sleep deprived brain for you. I hope Annabel adores it as much as I do. Oh a trunk show would take more space than we have in our luggage, though I do think there will be a mini trunk show for family when we arrive! I was wondering how you were going to do it. I’m still thinking I’ll have to post mine. Such a sweet quilt for a little girl! I’m sure she’ll love finding the bees and flowers and other little critters. Really, really beautiful. Love your emails. I love it! I may have to get that pattern it’s so sweet!! I love the Briar Rose fabric and this turned out beautifully (neat little fussy cut block too). Beautifully done! Such a lovely line of fabrics. I love the bees too! Absolutely love it! You can accomplish so much. Almost as much as you get done! Adorable quilt! Annabel will love spotting bees and crickets and strawberries and the like. that is really beautiful !! Thanks so much. I am really pleased with how it turned out. 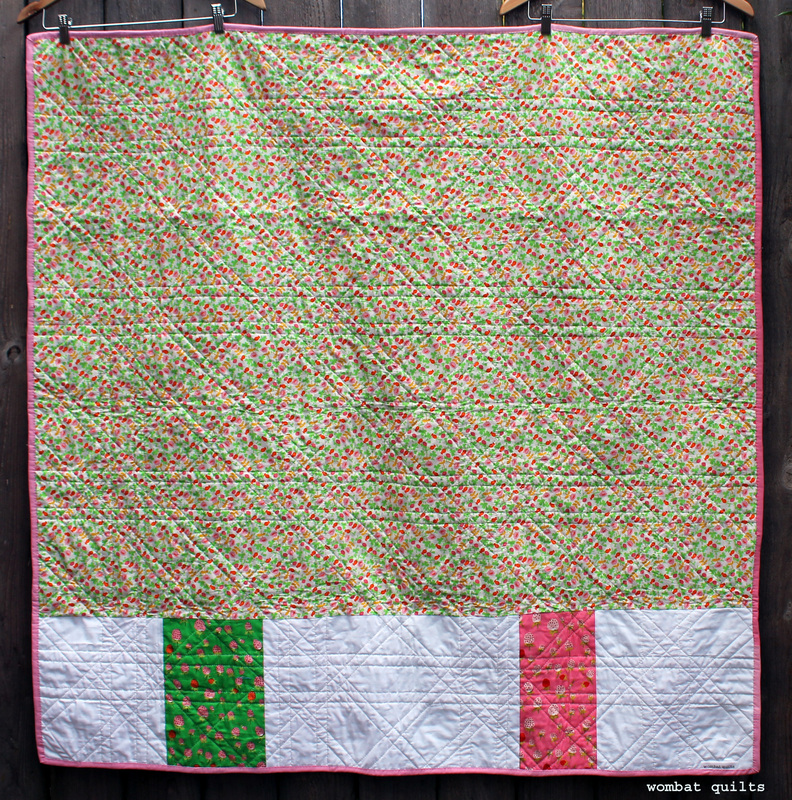 Oh, I do love this fabric and the quilt is so darling! You have done some lovely work with this line as well Elsa. I may just have to get some more of it before it all disappears! I love the bees! So cute! The fabric really does make the quilt. It is such a pretty line. Hi Cath, just got scanning through your blog and I obviously missed this post. 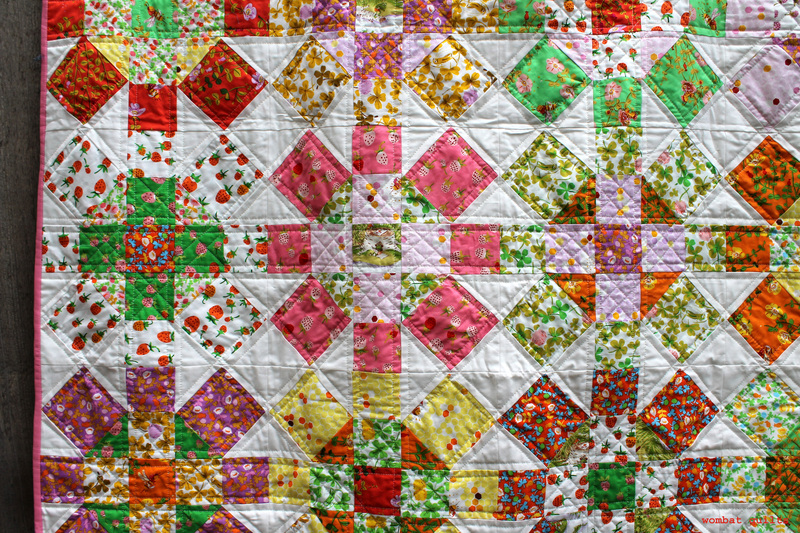 It is such a privilege to have this beautiful quilt in our house, and Annabel really is a very lucky girl. I have been marveling at the piecing and the quilting. The world is definitely a better place with all these beautiful quilts in it, it is a wonderful thing that you do. Lots of love to you and Nick.